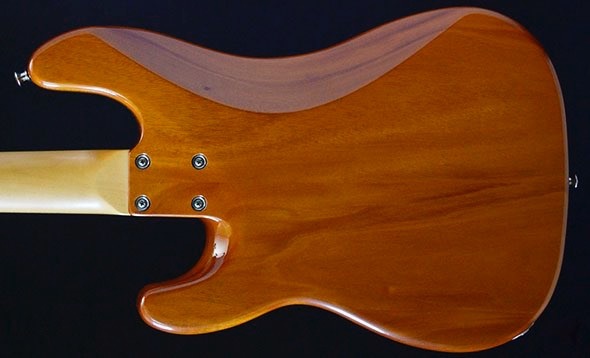 Hand built by master craftsman, Mike Lull and his team of skilled luthiers in Seattle, Lull basses have been making fine quality instruments since 1977. 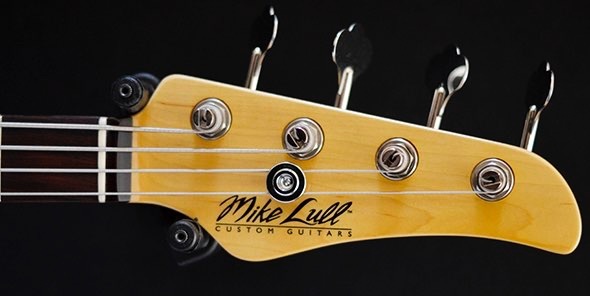 Mike's interpretation of the classic Leo Fender designed "Jazz" bass but with the exclusive Lull T pickups and takes the build and playability to a whole new level. Lightweight, fully seasoned instrument grade wood is combined with the finest components for a really advanced bass guitar experience. Classic tones with more depth, range and variety than the original, a real "players" bass for the 21st Century. W e’re going to guess you’ve never heard of Mike Lull. We make our living from knowing about boutique luthiers, and we were barely aware of him – and yet his instruments are seen on stage with Pearl Jam, Bob Dylan, Foo Fighters, Joe Bonamassa and BB King to name but a few. Mike was working in guitar repairs at 16 and running Mike Lull’s Guitar Works at 21, becoming particularly well known for his fretwork and the playability of instruments he had set up. In 1995, he began making his own line of custom instruments, and we are privileged to have one of these magnificent, but low-profile, instruments in our hands. This one perhaps flies under the radar a little, with a classic P-style body with bolt-on neck and pickups from the trouser-flapping wonder bruiser that is the Thunderbird. Mike has taken no liberties with the PT5 body: it’s Precision Bass all the way. Shape, pickguard, control layout, everything is as Leo would have, and indeed did make it, except perhaps the paint job. Opening the lovely vintage-style cream and brown hard case, the blue sparkle finish nestling in the blue fur within seems to channel the 70s: in fact, Bootsy Collins might lean over your shoulder at any moment and take the PT5 for himself. The neck is bolt-on, as it should be, but the quality of Lull’s work shows here: where a Fender would have a chrome neck plate to buffer the bolts, Lull has his sitting in recessed washers which look very classy. The 35” scale neck is graphite-reinforced maple, and the fingerboard is a lovely piece of figured maple: not quite birdseye, but close enough. Too much quilting on a fingerboard might be over-ostentatious and distracting, but this works beautifully, and feels very luxurious. The neck itself is very comfortable, feeling relatively narrow for a 5-string, in a positive way. 4-string players will not feel excessively stretched, especially near the nut, and yet there’s plenty of string spacing to avoid any feelings of cramp. The body might be pure Precision, but the hardware is emphatically not. Instead of Fender’s classic stepped pickup, the PT5 has a pair of pickups which are the result of Lull reverse-engineering Gibson Thunderbird pickups and adding a little twist of his own. They make a big, menacing, chrome-y statement which would tell anyone with a smattering of bass knowledge that what they are about to hear is no ordinary Precision bass. The fret job is flawless, as you would expect from a luthier who built his reputation on playability and makes much of the PLEK fret levelling system used in his shop: each of the 21 frets is perfectly seated and filed, as well as being beautifully level. The aluminium bridge looks very solid and is fully adjustable, while at the other end there’s a bone nut. 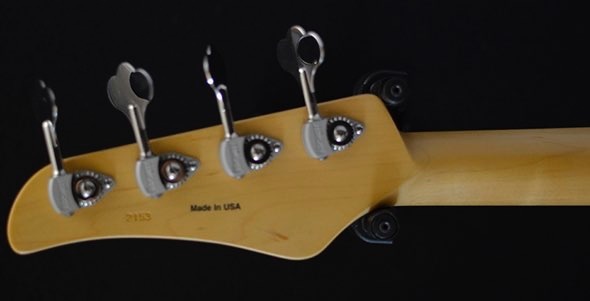 Truss rod access is a doddle, with an opening at the end of the fingerboard, and the trademark Mike Lull headstock has five Hipshot Ultralite tuners. These look 100 per cent traditional from the front, with their ‘big ear’ buttons, but from the back they’re ultra-modern, and are accurate and smooth in operation. The on-board controls, a simple volume, tone and mix control, are passive and operated straightforwardly from their knurled chrome dials. This might look like a Precision, but it really doesn’t sound like one; with those two mighty T-Bird pickups, it’s thunder all the way for the PT5. With the tone down all the way, it enters territory that’s too muddy to be usable, but you don’t have to come back up very far before you’re overwhelmed by the commanding power and depth of the tone. Punch is resolutely out to lunch: even with the tone wound right open, you need serious EQ surgery on the amp to make this bass sound funky for slap, but that’s missing the point. 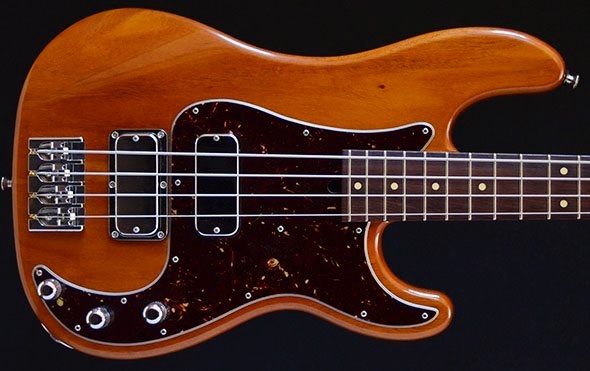 This bass is all about the low-down and the power; you can get smooth, cello-like J-bass tones, but for all the Fender ergonomics, this bass wants to sound like a Gibson, and classic rock tones bellow from it as though John Entwistle himself were on the frets. Things do smooth out the more you move to the neck pickup, but head for the bridge and you’ll get a really fat, aggressive tone which will drive your amp to break up beautifully if you let it. The PT5 is perfect for those who want the thundering tone of a Gibson bass, but don’t want the exhibitionist look of a Thunderbird. It’ll provide you with all the depth you need to push the audience’s stomachs through their backs, especially in the 5-string version, but with the relative anonymity of P-bass styling. 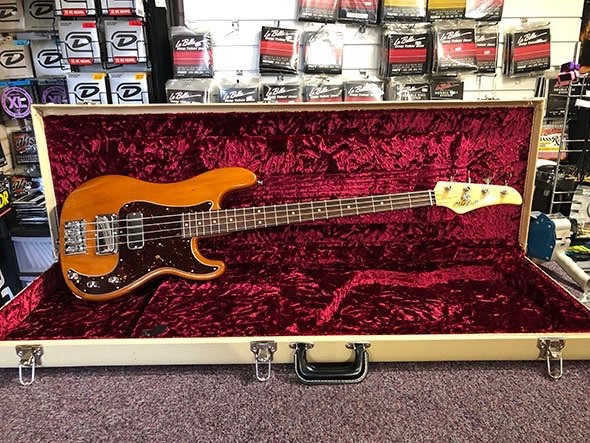 Everything about this bass screams workmanlike, usable quality; it’s a bass you’d be happy to play every night, and while it’s not cheap, it’s worth every penny. This is a bass which will love you right back.